Mainstream consensus is that life arose on Earth spontaneously out of “primordial soup.” Yet this theory, as well as the Darwinian “survival of the fittest” concept as it relates to major steps in evolution, has no scientific basis or proof. Where, then, did life come from? As the authors show, with conclusive scientific evidence, life came from space--a concept known as “panspermia.” We humans, and all other life on Earth, evolved over millennia in response to viruses that arrived via comets, and we continue to do so. Exploring the philosophical, psychological, cultural, and environmental ramifications of the acceptance of panspermia, the authors show how the shift will be on par with the Copernican Revolution--when it was finally accepted that the Earth was not the center of the Universe. Explaining the origins of the panspermia theory in the work of the late Sir Fred Hoyle, the authors reveal the vast body of evidence that has accumulated over the past 4 decades in favor of the cosmic origins of life, including viral inserts found in DNA that have shaped our human genome over millions of years. They show how the tiniest of viruses, microscopic animals (tardigrades), and even seeds have been found to be natural cosmonauts. The authors also show how space-borne viruses play a crucial role in the positive evolution of life and that our entire existence on this planet is contingent on the continuing ingress of cosmic viruses. 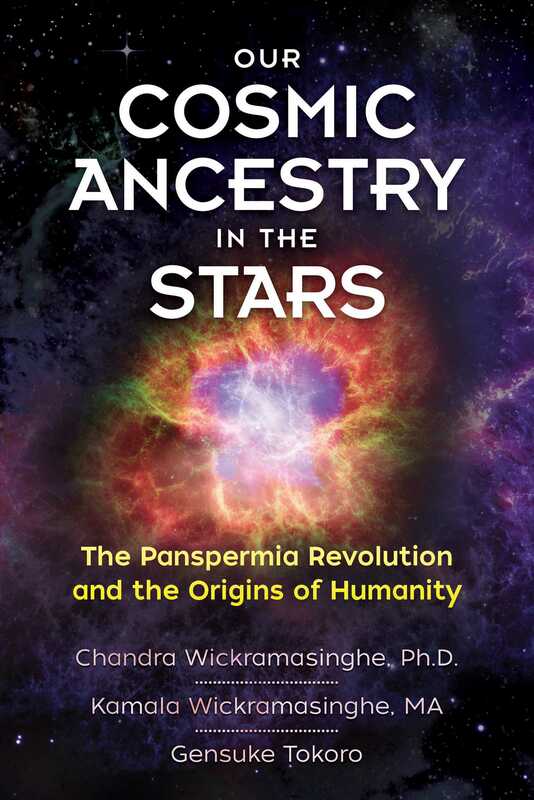 Revealing how panspermia offers answers to some of humanity’s longstanding questions about the origins of life, the authors discuss the impact this shift in understanding will have on our relationship with the Earth and on culture, history, and religion. And perhaps the most dramatic ramification of all is that acceptance of panspermia means acceptance that Earth is not unique--that other life-filled planets exist and intelligent life is common in the Universe. Not only did we come from space, but we are not alone. Where have we come from? Where are we going? What are we here for? Is life unique to this rocky planet we call Earth? These are the deepest of philosophical questions and perhaps the very first that were asked as soon as Homo sapiens acquired the intellectual capacity to do so. The first answers, as far as we can glean from surviving fragmentary evidence--folklore and cave art--invariably turned to the skies. The spectacle of the Milky Way must surely have overwhelmed our ancestors, as indeed it overwhelms us today. This sense of awe may have led directly to the concept of the sun god and other gods, all of whom were placed in the skies. The Humans--Homo sapiens--were still helpless creatures beholden and subservient to the inexorable power of the universe. The harsh vicissitudes of nature--droughts, floods, storms at sea, earthquakes--all contributed to enslave and humiliate them. They needed the gods of the heavens to provide comfort, solace, and safe passage through the journey of life. Humankind’s subservience to Nature has found expression in art from the earliest cave paintings to modern times. With advances in technology some of the cruelest forces of nature were tamed. Civilization marched forward and our ancestors began to feel they were more and more in control of their destiny. Control appeared to shift from the universe with its capricious ever-changing patterns to the fixed Earth, which was deemed constant, eternal, and largely under human control. We realize now, or at least we should have realized, that our entire genetic heritage (except for minor tweakings) came from the vast external universe. Earth was just an insignificant building site upon which the blueprint of all life came to be assembled into a great multitude of different forms. Throughout the universe there are countless other building sites, more or less like the Earth, on which the same process must have occurred. So the humbling realization is that we humans, and indeed all other life on Earth, are utterly unimportant in the wider cosmic context. One of the most exciting areas of modern astronomy is the search for planets orbiting distant stars--planets that are habitable and more or less similar to Earth. Many studies directed at such searches are presently underway deploying telescopes that are in orbit around the Earth. The currently estimated tally of Earth-like planets runs to over a hundred billion in our galaxy alone--averaging about one “Earth” for every sun-like star. The implication is that the average separation between two Earth-like planets is a mere four light years. This incredibly short distance in cosmic terms clearly implies that exchanges of bacteria and viruses between such planets is not only possible, but inevitable. Very recently astronomers have detected evidence for a rocky planet like Earth orbiting our nearest neighboring star Proxima Centauri. This star with its Earth-twin is only 3.1 light years away--a spitting distance from us in cosmic terms. Living material in the form of bacteria and viruses that reached Earth over the past four billion years must surely have reached the planet around Proxima Centauri as well. Life very similar to Earthlife may well have flourished there, from cosmic genetic building blocks. Evidence for the most ancient bacterial life on Earth has recently been discovered in the form of carbon globules trapped within crystals of the mineral zircon deposited in rocks that formed 4.1 to 4.2 billion years ago during the so-called Hadean epoch. At this time the Earth was being relentlessly bombarded by comets, the same comets that also brought water to form the Earth’s oceans. It is reasonable to infer that the same impacting comets also delivered the first life to our planet in the form of bacteria and viruses. Thereafter the addition of viruses from comets expanded the genomes of evolving life on the Earth. One dramatic event 540 million years ago, the Cambrian explosion of multi-celled life, is now known to have brought essentially all the genes that were needed to generate the entire range of evolutionary development witnessed in the record of life on the Earth. We have noted that the information content of life at the molecular level is of a superastronomical magnitude. The logical conclusion is that this crucial information for life’s origin and evolution is always present in the Universe, and that genes carrying such information are continually amplified and distributed through the agency of comets. Bacterial and viral genes delivered to the Earth are continually being added to genomes of evolving life-forms. Major evolutionary traits in the development of complex life are all externally derived, and evolution itself is a process that is essentially driven from outside. If this is the case, the overall impression will be of a pre-programming leading to the higher levels of development in biology. Even some less definable manifestations of gene expression in our own hominid line of descent, for example the emergence of genes for higher levels of cognition, bear the signs of “pre-programming” or pre-evolution. We now know that impacts of asteroids and comets on planets laden with life can not only cause extinctions of species (e.g. the extinction of the dinosaurs 65 million years ago) but also cause the splash back of life-laden material (dust and meteorites) that can reach neighboring planets. We can argue that Darwinian-style evolution occurred not on any one planet like Earth but was spread over innumerable habitats in the grandest possible cosmic setting. Whatever happened, it is clear that life cannot be regarded as unique or confined to the Earth. Life on Earth implies life everywhere. It follows that life of all the types and forms known on Earth, ranging from bacteria to plants, animals, and even intelligent life must, to a high degree of probability, be all-pervasive. This is now not just a theory but an inescapable fact. Chandra Wickramasinghe, Ph.D., is the director of the Centre for Astrobiology at the University of Buckingham. A professor of applied mathematics and astronomy, he has taught at the University College Cardiff and the University of Cambridge. He is also the editor-in-chief of the Journal of Astrobiology and Outreach and lives in Cardiff, Wales. Kamala Wickramasinghe, MA, is a freelance writer and editor with a master’s degree in English from the University of Cambridge. The managing editor of the Institute for the Study of Panspermia and Astroeconomics (ISPA), she lives in Cardiff, Wales. More books from this author: Chandra Wickramasinghe, Ph.D.